Donovan Mitchell started at the “Larry H. Miller Court” logo near the scorer’s table, yo-yo-ing a right-handed dribble. Suddenly, he put on a slight hesitation shimmy-shake that got defender Luka Doncic leaning juuuust a bit too far. That was enough. Mitchell went lefty, sending the heralded Slovenian teen stumbling as he backpedaled, and Mitchell was in the Express Lane to the Highlight Reel. As he accelerated through the paint, switched the ball to his right, and cocked it back as he ascended, Maxi Kleber made the unfortunate decision to step in and challenge — fulfilling in the process an apparent childhood dream to appear on a poster. The masses assembled within Vivint Smart Home Arena rose to their feet, put their hands to their faces, and issued a collective OH MY GOD DID YOU SEE THAT?! With one ferocious, incendiary, spirit-reaping jam, Mitchell reminded anyone silly enough to have forgotten while he sat out with a sprained ankle that the Jazz are an altogether different entity with him on the court. The only person for whom it was not that dramatic, apparently, was Mitchell. His first half up to that point had been nondescript — his dunk got him his seventh and eighth points, respectively. Still, it was an event of sorts, injecting a dose of energy into a building that had become as lifeless as Dallas’ defense. Mitchell picked up where he left off in the third quarter. Less than a minute in, he again flew down the lane untouched, grabbing an errant Joe Ingles shot just off the rim for a putback slam. A minute and eight seconds later, he took a pass from Rudy Gobert and sank a 3. A minute and a half after that, he took a pass from Ingles and again drilled a deep ball. In just three and a half minutes of third-quarter action, he doubled his scoring total. His next basket didn’t come until 6:47 remained in the game, though it was a key one. 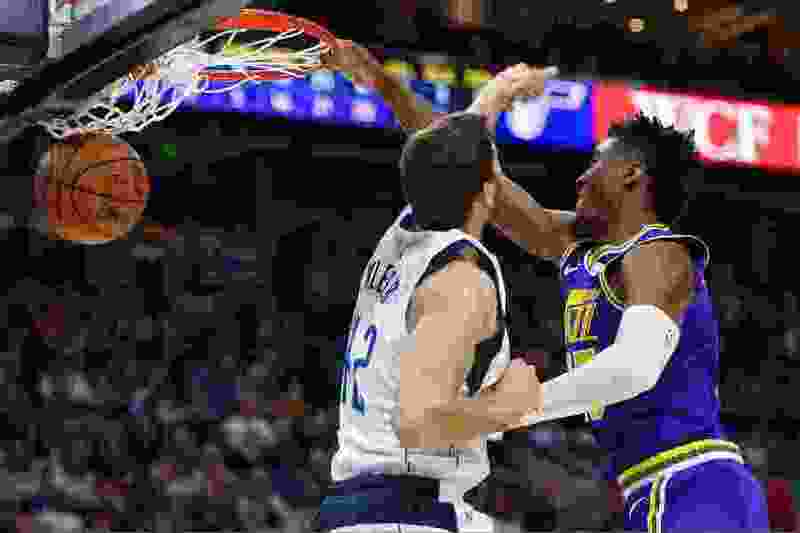 With the Mavericks having cut the lead to nine, and the Jazz offense stalling, Mitchell went lefty again, beating Wesley Matthews horizontally across the paint, then flipping in a scooping lay-in. It proved merely the start to yet another stellar Mitchell minute. He followed with two free throws, then, after driving headlong toward the rim and going up in the air, only to be met by DeAndre Jordan, he deftly rocketed a bounce pass to a wide-open Jae Crowder in the far corner, who calmly drained a 3, extending the lead back to 107-94. He finished with a team-high 23 points, as well as five rebounds, seven assists, and two steals. Coach Quin Snyder was happy to see his star guard continue to grow and just take advantage of the moment.